The parish of the Church of the Nativity of Christ was originally chartered in 1916 by Russian Old Believer immigrants who had come to the United States during the latter part of the 19th century and early part of the 20th century. The Old Believers who made up the founders of the Church of the Nativity of Christ in Erie came from those priestless Old Believers who emigrated to the shores of the Northern Lakes, and thus became known as the pomortsi, or shore-dwellers. At some point, they then emigrated to an area now in Poland, then a part of Russia’s western outskirts known as suvalki-sezhny. Upon arriving in America, many of these Old Believer immigrants chose to move to Erie, where work on the ore and pulp docks was available. These docks were located on the Erie bayfront, directly north of the current location of the church. By 1916, scores of Old Believer families were located in the area, and the community’s leaders decided to build a church. 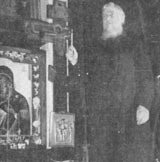 The first church was dedicated on the feast of the Dormition of the Mother of God in 1919, and the first full-time nastavnik (or “teacher”), Father Nikon Pancerev, assumed the role of spiritual leader in 1923. 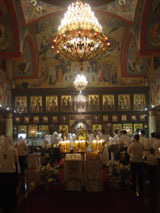 In the parish’s early years, the Old Believer traditions remained completely intact, and the members of the community retained their Russian ways. However, the arrival of World War II led to the “Americanization” of the parish. Men shaved their beards; women cut their hair; children began to speak only English. Thus, by the time Father Vladimir Smolakov assumed the role of nastavnik in 1952, the parish had undergone serious changes. Although the arrival of the “baby boomer” generation meant that the church was packed during Saturday Vespers and religious education was at an all-time high, the Old Believers often saw their attention drawn to social activities instead of church services. When Fr. Vladimir retired in 1972, he was essentially keeping his finger in a crack, trying to prevent the floodwaters of Americanization from drowning the community. After Fr. 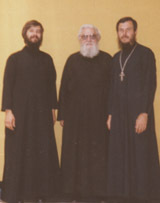 Vladimir’s departure, Father Pimen Simon eventually succeeded him in 1976. Father Pimen took leadership over a parish that was rapidly dwindling as the English-speaking community had no understanding of their faith, which they heard only in the Church Slavonic. Finally, after much discussion and deliberation, Father Pimen determined that it was necessary for the future of the parish to introduce English into the services. Beginning on the Sunday of the Prodigal Son in 1980, services began to be conducted with at least some English. A more controversial decision occurred two years later. After carefully studying the schism in the Russian Orthodox Church in the 17th century and the effects of losing priesthood, Father Pimen came to the conclusion that the parish must do everything possible to reunite itself with the fullness of the Church. A small study committee was formed in 1982, leading up to a full parish vote on Janury 9, 1983. At that vote, approximately 80% of the parish voted to unite with the Russian Orthodox Church Outside of Russia. On July 24/11, 1983, Father Pimen was ordained to the priesthood by Archbishop Laurus and the Church of the Nativity was finally consecrated. During Dormition fast of 1983, Father Pimen chrismated over 500 parishioners, who all partook of Holy Communion for the first time in their lives on the Feast of the Dormition, Sunday, August 28/15, 1983. In 1984, Fr. Theodore Jurewicz, a world-famous iconographer joined the parish as its assistant priest. Fr. Theodore continued the beautification of the church by painting many icons which added to the feeling of fullness of the church and the Orthodox liturgical rite. Late in 1985, the parish approved the request of Fr. Pimen to sponsor the 8th Annual Orthodox Conference in Erie. This event would bring bishops, priests, and hundreds of Orthodox faithful to the Erie parish for a weeklong conference beginning on July 27, 1986 and ending on Aug. 7, 1986. But on the afternoon of July 22, 1986, last minute preparations were being made for the conference when the maintenance worker saw smoke coming from the ceiling vent over the choir. By thetime the fire department was called, the entire attic area—made up completely of 67-year old timber—was engulfed in flames. Soon, the flames shot through the roof; the ceiling collapsed in many areas; the 150-light chandalier purchased from Greece crashed to the floor; the walls buckled out. After hours of firefighting, the parishioners were astonished to find the royal doors, deacons doors, iconastasis, icons, books, altar, vestments, and sanctuary miraculously intact and not even damaged. The despair of 4 p.m. turned to exaltation, thanksgiving, and hope by 6 p.m. A meeting was held in the Community Center at 7 p.m. The conference was to go on as scheduled. The Community Center was to be used as a temporary church. By the next day, Fathers Pimen and Theodore, architect Ross Rectenwald, and Martin Simon—former Parish Council president and member of the newly appointed building committee—were pacing off distances for how large the renovated—or new—church should be. Jim and Tim Schaff of Building Systems, Inc. were at the church within minutes of the fire. By week’s end—without pay—they had shored up the buckled-out walls, they had built a temprary iconastasis in the Community Center, and had the Community Center looking and feeling like a real church. On Sunday, July 26, 1986, the Church of the Nativity parishioners, along with hundreds of conference attendees, worshipped God at their new and beautiful temporary church. On September 28, 1986, the service for the founding of a new church was held at the church site, and construction began in early-October. Through the hard work of Building Systems employees and parish volunteers, the new church was completed by the next summer. On the afternoon of August 25, 1987, the Holy Table was brought back to the sanctuary, and the first complete services were conducted on the feast of the Dormition of the Mother of God, exactly 68 years to the day that the original Church of the Nativity was opened in 1919. Another remarkable event to effect the parish took place with the Consecration of Dimitri Alexandrow as the first bishop of the Russian Orthodox Church Outside of Russia to be consecrated solely for Old Believers. Fr. Dimitri was consecrated a monk and took the monastic name of Daniel. He was consecrated as Bishop of Erie and the Old Rite on the feast of the All-Merciful Savior on August 14/1, 1988. His consecration was an historic event in the history of the Russian Orthodox Christianity, as well as the history of this parish. Vladika Daniel’s gentle and loving demeanor has made him a beloved shepherd to his flock. The rest is history. After so many historic and often traumatic events, the years after the restoration of priesthood and the construction of the new church have been tranquil and blessed. The parish size has remained fairly stable while church attendance has actually grown. This can be explained by the fact that the services in English coupled with the presence of a complete cycle of Divine Services – especially the Divine Liturgy – has led to an enhanced devotion among the parishioners. This phenomenon can also be attributed to the presence of adult converts to the Old Orthodox faith who bring devotion often lying dormant in so-called “cradle Orthodox”. It is probably accurate to estimate that by the beginning of the 21st century, approximately 1/3 of the parishioners had converted to Orthodox Christianity during adulthood. This has also sealed the end of the Russian ethnicity of the parish, which was eroding even without the presence of non-Russian members. The parish leaders have striven, however, to make sure that the loss of Russian ethnicity does not mean the loss of diligent Old Rite Orthodox Christianity. Over the past century, our parish has evolved dramatically while still managing to retain intact the Old Rite of the Russian Orthodox Church. We hope with God’s blessings and guidance and with the dedication of our parishioners that this history will someday be seen as only the preface to a story that continues for generations and even centuries to come. But all of that is in God’s hands, and we end by thanking Him for preserving and protecting us during this first century of our existence. Glory to Thee, O God. Glory to Thee for all things!